Ally Invest’s commissions for stock, futures, and options trades are some of the lowest in the industry. If you trade more than 30 times in one fiscal quarter or have a combined average daily balance of more than $100,000, Ally only charges $3.95 per stock or ETF trade and $0.50 per options contract. One of the biggest problems with online discount brokers, who offer very cheap trades, is the lack of quality services that higher-priced brokerage typically offer, like 24/7 customer service. This isn’t the case with Ally Invest. Ally has 24/7 customer support via phone and live chat. We reviewed Ally’s live chat multiple times. Each time we asked a question, a representative responded with the correct answer within 1 minute. Phone wait times were also brief and we were always connected with a customer service representative who knew what they were talking about in terms of trade related questions. 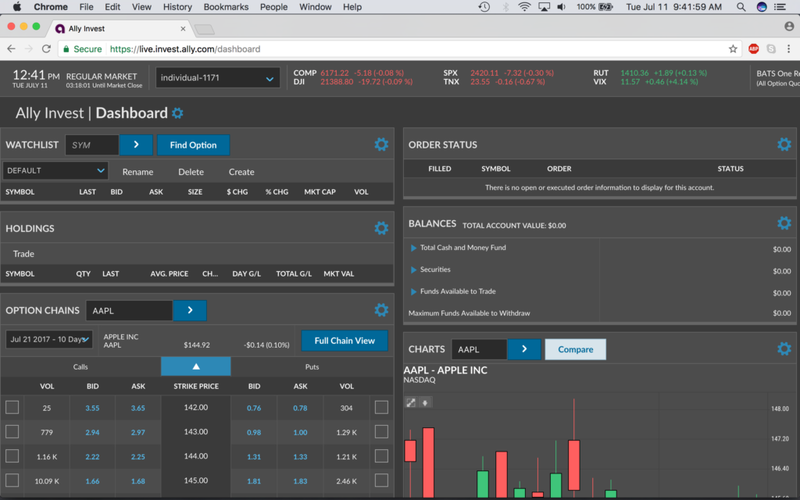 Every online brokerage has to have a digital interface where clients can place trades. A lot of online brokerages have clunky, slow, and buggy downloadable software made for Windows circa 1990. Ally has a sophisticated trading web-based trading platform that they adopted when they acquired TradeKing (TradeKing was renowned for having trader-friendly software). 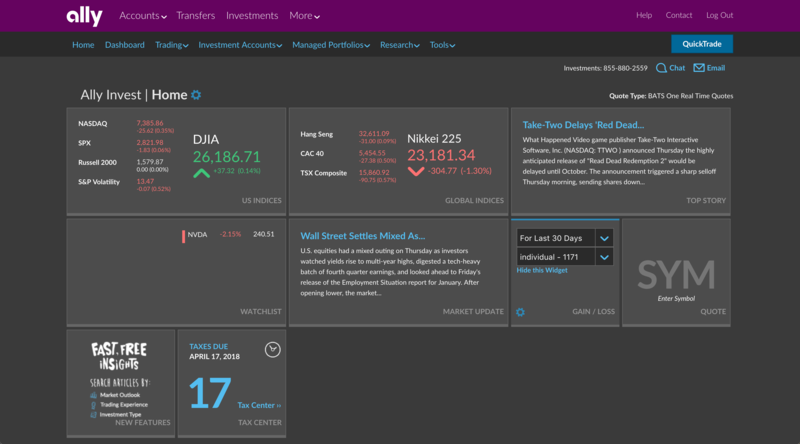 The layout of the browser-based Ally Invest platform is easy to navigate and highly customizable. 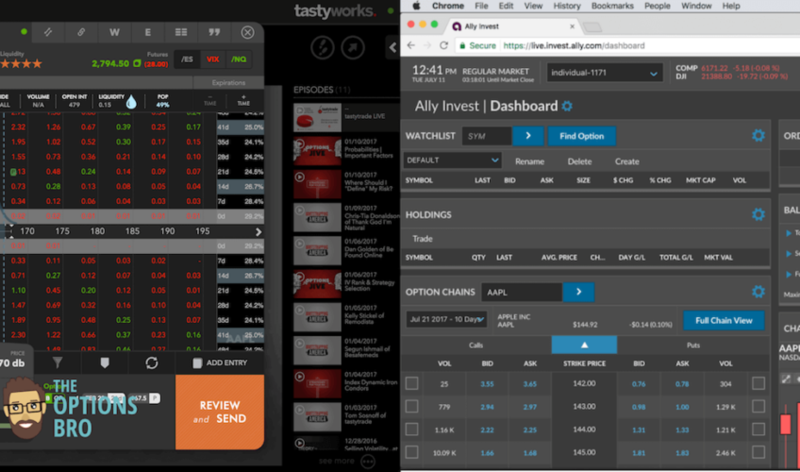 Ally Invest’s home trading dashboard is simple to use and highly customizable. Clicking on the gear cogs allow users to edit, add, or remove widgets from the main trading panel. Light and dark themes are also selectable. Placing trades is relatively intuitive and quick. Plus, we fell in love with the Market update widget and found ourselves relying on it to quickly find out what was going on in the markets on a given day. We were also pleasantly surprised with the charting capabilities on the platform. Clients can apply nearly 100 different technical studies on charts of stocks they follow. And for those who prefer fundamental analysis, Ally offers a wide range of research on individual companies. 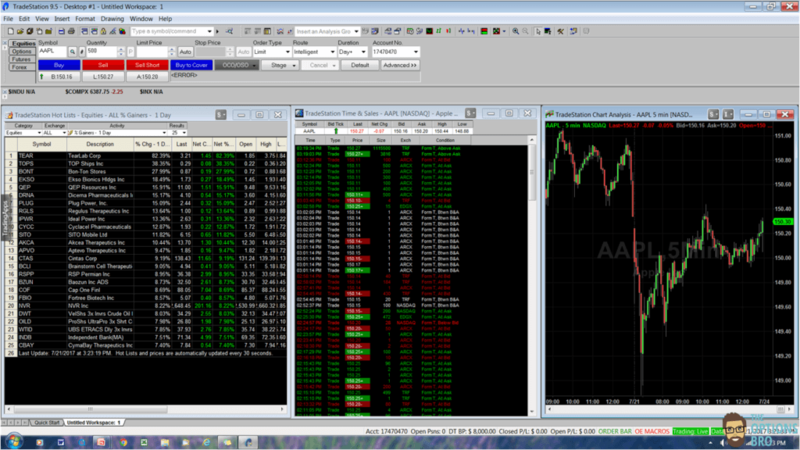 Ally Invest’s stock trading layout. The option chains at Ally are also really slick and fast when loading prices during peak market hours. A lot of online options trading software can see delays during periods of high volatility or usage, because options chains have to load a lot of data simultaneously. We never encountered any problems with Ally’s option chains. 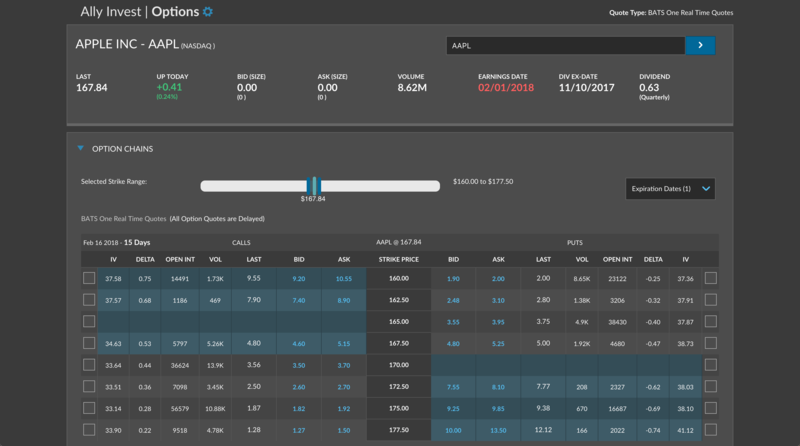 Clicking on individual option bid/ask prices enables users to directly buy or sell that option, which is always a feature we look for in an options trading platform. Moreover, it’s very easy to discern which options series are weekly and which options series are regular, because Ally marks all weekly options with a “W” in the Expiration Dates selection box – pretty nifty. Ally adopted TradeKing’s fantastic options chain. Trading on mobile is quick and easy. The Ally Mobile app has a 5 star rating in the app store with 4,400 reviews. We love using it to monitor the market and our positions. 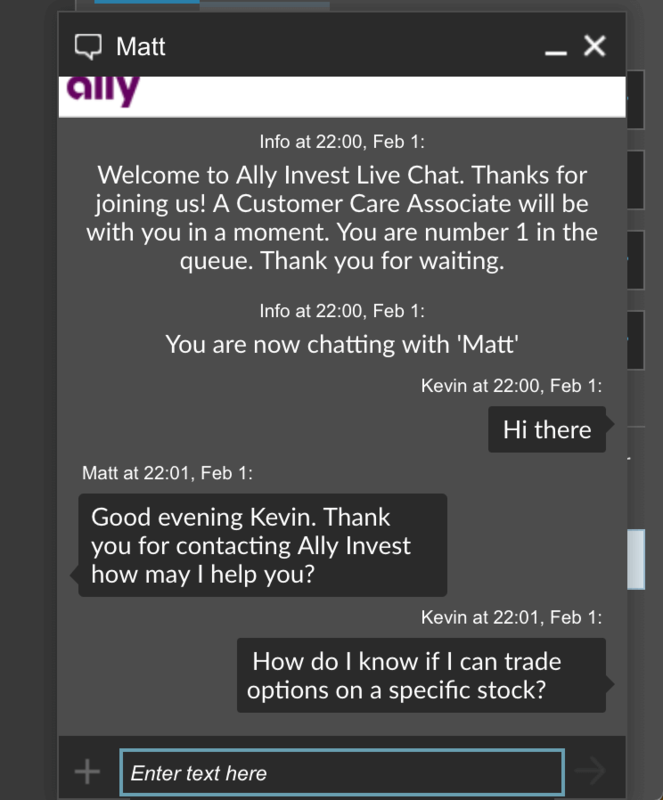 Another great aspect of Ally that confirms their rank as the best online broker is the fact that they actually listen to client feedback and make changes. What else can we say? The Ally mobile app checks all the boxes. Charting, watch-lists, trading, and even mobile market research are quick to navigate to and easy to use. The mobile app provides full functionality in terms of order types (market, limit, stop, etc.) and time in force. 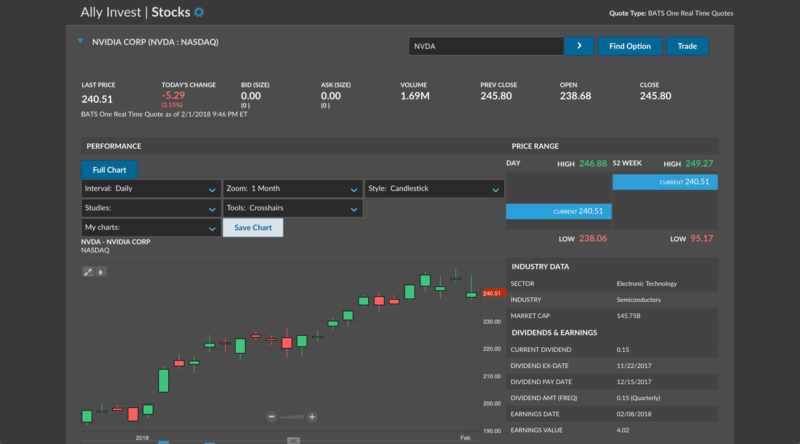 Moreover, it’s very easy to quickly pull up a chart of a given stock, check for any recent market moving news, and then trade the same stock from within the same screen. This is a feature that we really enjoy. Not having to navigate to another screen within the app to actually place a trade saves a lot of valuable time. Most importantly, when logging into the mobile app and loading options chains and charts, we never experienced any long load times, lag, or choppy data. We even tested it during peak market hours (immediately before and after the open and close) and we had absolutely no issues. When everything is put together, Ally Invest offers a very attractive online investing experience. Coupled with the fact that you can deposit your money with a top-rated online bank with savings products frequently in the 1.85% APY range, there are plenty of cash management options available. From the mobile app to the browser-based trading platform, logins are quick and load times are short. One of the areas where Ally could improve is with the pending integration of futures trading from MB Trading. Having to go to MB’s site to trade futures is okay, but it’s kind of time consuming. It would be significantly easier if all assets could be traded from the current Ally Invest platform; we were informed this is coming in 2018. Plus, as is common with many online brokers now, transparency for maintenance and other trading-related fees sometimes is not what it should be. There is nothing worse than logging into an investment account after a few months of inactivity to discover a list of fees and charges. This is another reason why we love ally, because they charge any inactivity or maintenance fees, and their commission pricing structure is very transparent. In our opinion, Ally Invest offers the total online broker package. The cost of trading is extremely cheap, trading technology is on par with professional trading software, customer service runs 24/7, and the overall Ally experience is very easy to get used to. Ally gets 5 stars in our book. 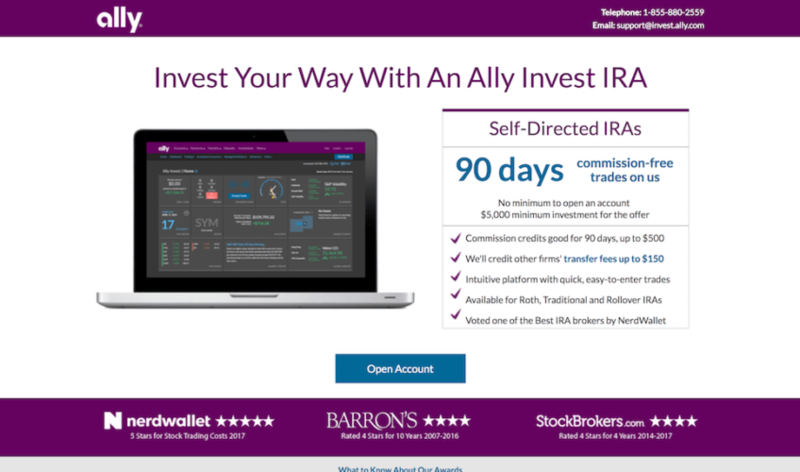 And while Ally might not have the same recognition as some of the heavy-hitting brokerages like TD Ameritrade and Fidelity, we truly think Ally will be the leading online brokerage and bank in the coming years. As an online-only bank , more and more millennials are choosing Ally to serve all of their online banking and trading needs. It’s really not hard to see why.